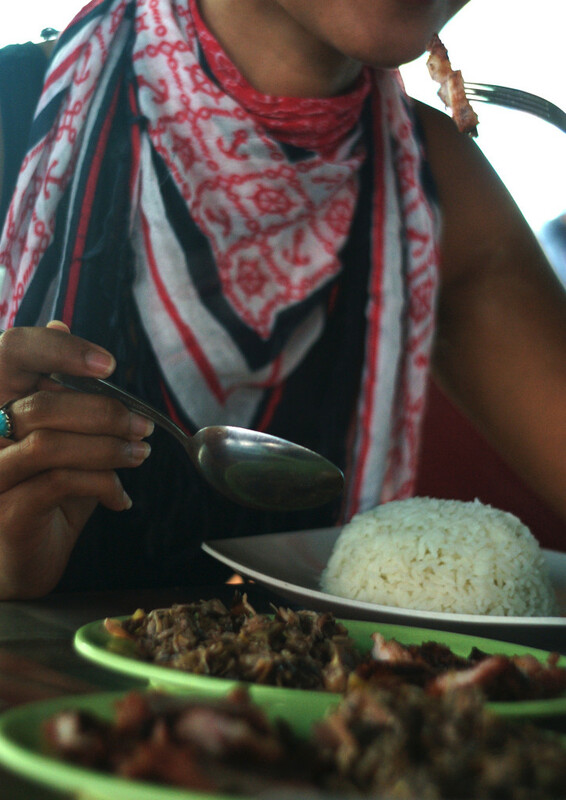 Se’i babi is East Nusa Tenggara province’s local delicacy that uses pork as its main ingredient. “Se’i” means smoked meat, while “babi” is Indonesian for both pig and pork. Having landed and checked into our hotel in the province’s capital of Kupang, my friend and I simply could not miss the opportunity to try some local food. The hotel suggested we go to Bambu Kuning restaurant in the Oepupu area. There are other eateries in the city famous for their se’i babi, such as Warung Pojok, Gracia and Se’i Petra. The one village that is often associated with the dish, however, is Baun, less than 30 kilometers south of Kupang — too far a drive for our famished stomachs. At lunch hour, Bambu Kuning’s dining area was full of families and government employees. Digging heartily into plates of pork se’i, grilled pork ribs, pork rica rica (pork stir-fried in super-spicy thin sauce) or pork leg soup, the customers’ faces were all sweaty. The open space on the left side of the restaurant was where the pork strips were smoked for five to nine hours on live charcoal. The charcoal that is used is special too; made from kesambi or gum-lac tree, which leaves are also used to flavor the se’i by simply placing them on top of the meat during the smoking process. I had never tried pork before. Waiting for my se’i babi to arrive felt like preparing myself for my first rabbit satay a few years ago. I prayed for the cute bunny’s soul the same way I now prayed my parents never come across this article — they’re pious Moslems, you understand. Had I visited the city in the ‘80s, it would be less dilemmatic as venison se’i was still easy to find — sorry, Bambi. Our se’i babi finally came with hot rice, pork broth, raw onion sambal or sauce, as well as stir-fried, chopped banana heart or inflorescence. Another side dish commonly served with se’i babi is stir-fried papaya leaves or flowers, or the mixture of both, but unfortunately Bambu Kuning had ran out of the stuff. Spotting my hesitant look, my friend said I should just imagine we were going to eat soto, which is a kind of soup. So I did. The meat was tender and juicy, the broth smooth and the banana heart spicy. The sambal gave the combination an extra kick — hot weather was not the only thing to blame for the sweaty faces. We found Bambu Kuning’s se’i babi so good that we asked for more. My friend even ordered a big portion to be picked up the next day before our flight. We headed back to the hotel with a full stomach and, on my part, a slight tinge of guilt. As I found weeks later that there are restaurants in Kupang that serve beef se’i, I may settle with it should I happen to return there one day. But to those who love pork dishes, I have to say that Kupang has the best ‘soto’ I have ever tried.